Colin Gilmore, a Lubbock native and son of well-known Lubbock singer/songwriter/recording artist Jimmie Dale Gilmore, spent many nights as a child in nightclubs such as Stubbs, where he witnessed songwriters like Joe Ely, Terry Allen and his own father, Jimmie Dale Gilmore. He developed a taste for Buddy Holly, Townes Van Zandt and bands such as The Clash and The Pogues. Gilmore has been writing, performing and touring for more than a decade. His latest release, The Wild and Hollow, recorded in Austin and Chicago, showcases rich arrangements and instrumentation while still leaning on his roots rock and singer/songwriter foundation. 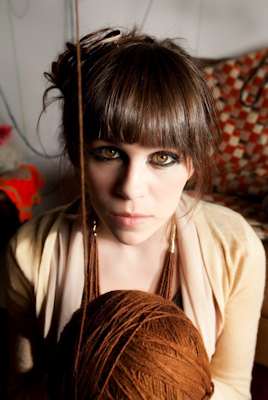 Nicolette Good is a Texas singer-songwriter and 2012 winner of the Kerrville New Folk competition. In a voice that’s at once refined and raw, Nicolette sings with penetrating insight about hope, wrenching love, and the mysteries of everyday life. Claire and Paul were so pleased and excited to welcome Danika and The Jeb – vocalist Danika (prounounced DuhNEEkuh) Holmes and guitarist Jeb Hart – in their first HubCityMusic.com house concert appearance on March 31, 2018. You may have heard Danika on Sirius XM’s Coffee House station or on one of 150 radio stations around the US spinning her tunes. Or maybe you saw her opening for acts such as Dierks Bentley and Phil Vassar. Or in theaters, wineries, clubs and living rooms around the US, UK and Europe in one of over 400 shows since 2010 when she decided to pursue music full time. 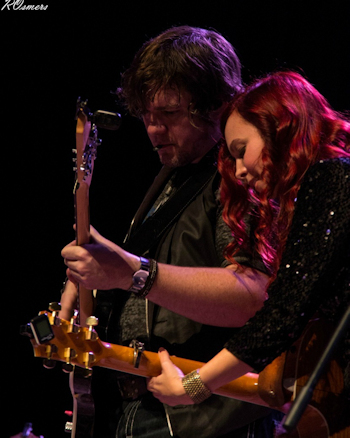 Danika joined forces with guitarist Jeb Hart, a phenomenal player who’s not afraid of shredding on an acoustic guitar. Who ever heard an acoustic guitar sound like a Les Paul electric? Jeb does that, among his many guitar stylings. Jeb’s clean and sophisticated playing, paired with Danika’s smooth and soulful vocals, has created a magical combination. With all the Sirius XM exposure, and so much radio station play, Danika and Jeb are on their way to bigger places in the music business, while sharing their talent and music in our intimate, personal venue along the way. Don’t miss this opportunity to catch these rising stars! Looking forward to seeing you here! Danika asked me to forward this personal message to you from her. Hello friends and patrons of HubCityMusic.com House Concerts! Thanks for letting us take 2 minutes of your time today. If you don’t know me, I’d like to change that. I make up half of the acoustic duo that performed a concert at Paul and Claire’s home on March 31, 2018. (Danika & The Jeb). We realize that TIME is your most precious resource, and it’s limited. And we want to thank you for spending your time with us. You can always expect to leave one of our concerts feeling good. We make that our point. We keep things upbeat and uplifting, but aren’t afraid of tackling real life issues that we all deal with. You might laugh at times, and maybe even shed a tear… regardless, we hope that you’ll leave having felt something through our music that is real. A true, genuine connection… that’s what we’re hoping to achieve. After all, that’s the entire reason we’ve devoted our lives to writing, touring, and performing meaningful music. You’ll be hearing our own original music, stories, and a few carefully selected cover songs as well (from the Beatles and Stevie Wonder to name a few!) Also, you can expect some phenomenal guitar playing from Jeb. Fine, you can call me biased… but I’m willing to bet that once you see Jeb play, you’ll agree with me. My personal email is danika@danikaholmes.com. Feel free to drop me a line if you have any questions, or just want to say hello and that you got this email. We really appreciate you taking time out of your busy schedule’s to come to the show and enjoy some music! We also really appreciate Paul and Claire with HubCityMusic.com House Concerts for inviting us for a concert and letting us reach out to you directly. We so enjoyed meeting you all! We are always so excited to host Tori Vasquez in a rare, intimate solo house concert! Most of you know Tori as the youngest daughter of Lubbock musicians Junior and Mickie Vasquez, and indeed Tori has made a name uniquely her own in the Lubbock music scene. Having been pulled away from Lubbock by her burgeoning music career, Tori is now based out of Austin, with her husband Shannon Smith. Although recently focusing on performing with their band The Battlin’ Nelsons, Tori is taking a one-time break from that format, instead choosing to come back to Lubbock to perform an intimate and rare solo house concert on Saturday May 13th, at Paul and Claire’s house. Tori has chosen a set list that includes some old covers and originals that she hasn’t played in a long time, interspersed with some new songs you may not have heard her perform. Join us for this rare opportunity to hear Tori solo in her home town, in an environment that is more close up and personal than any other. Claire and I were thrilled to again be hosting our good friend and musical legend, John Batdorf on Thursday March 9, 2017. And we were just as excited that Junior Vasquez was again opening for John, just like he did at the Lubbock Municipal Auditorium back in 1975! We are all a “little” older now, and the music is even better than ever! John is recording a new CD as we speak, so got to hear some of his latest, unreleased songs. 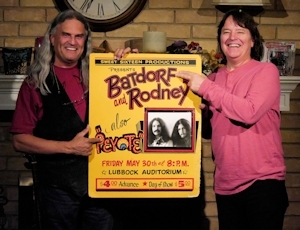 John Batdorf is an American singer-songwriter, solo artist, and one half of Las Vegas Rock and Roll Hall Of Famers, folk-rock duo Batdorf and Rodney, and folk-rock band Silver. He’s also a successful film and TV composer, session vocalist, and inspirational musician in the substance recovery community. In 1967, as a gifted teenage singer-songwriter, John Batdorf, ventured to Los Angeles, crammed in a Lincoln Continental with six of his friends, to become immersed in the formative and iconic musical era symbolized by Laurel Canyon and names like Richie Furay, Stephen Stills, Chris Hillman, Lubbock’s own Al Perkins, David Crosby, Roger McGuinn, and so many more. These went on to form some of the most influential bands of all time, and John Batdorf was part of that transformation as a founding member of Batdorf and Rodney, followed by Silver. If you grew up in that era, you will recognize many of their songs. Since that time, John Batdorf has remained a prolific songwriter, and is a far more accomplished musician now than even at the height of his success in the 1970s. Only once in the eight year history of our house concerts have we offered an opening act, and that once was when Junior Vasquez opened for John Batdorf in March 2015. It’s taken two years to get John back, and we could not be happier that once again Junior was able to open for him, just like he did in 1975. This was an amazing concert! In spite of the fact that John had missed some immediately previous engagements due to flu-like symptoms, he was able to rest and recover a few days prior to our concert, and his performance was as inspiring and musically perfect as always. There are few musicians who play and sing with the precision that John brings to his performances. Never a missed note. Add to that the emotional range that he brings, and you begin to understand why John Batdorf is one of the finest musicians in the industry today. Requested by popular demand, we were pleased to host vocalist and singer/songwriter, Sarah McQuaid, in a HubCityMusic.com house concert on Friday October 24, 2014. Sarah kept an enthusiastic audience spellbound with her silky smooth vocals, and engineer Martin Stansbury made his own unique and artistic contributions to the amazing sound. Sarah McQuaid definitely delivered the most unique voice to the HubCityMusic.com stage that we have ever experienced, and everyone who was in attendance was entranced. We will be hosting Sarah again in October 2015 for a CD release tour appearance, and you won’t want to miss that return visit! Sarah has toured all over the world, in places such as Ireland, England, Spain, Germany, Belgium, the Netherlands, and across the United States. She has released 4 albums, all to great critical acclaim, and has also authored a book, titled “The Irish DADGAD Guitar Book”. 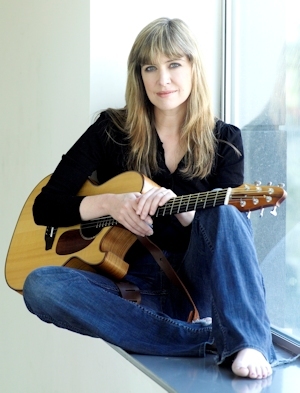 Sarah McQuaid’s voice is amazing, with a range from low and sultry to sweet and high. In many ways her voice is reminiscent of Carly Simon, as well as Joni Mitchell, and also reminds me of another vocalist from England with incredible vocal range, Julia Fordham. But of course, despite inevitable comparisons, Sarah is her own artist, with her own unique sound. “Rising star Sarah McQuaid’s voice has been likened to malt whiskey, melted chocolate and “honey poured into wine”. 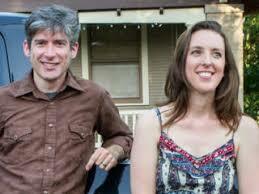 Check back here for video clips from her October 24, 2014 HubCityMusic.com house concert. 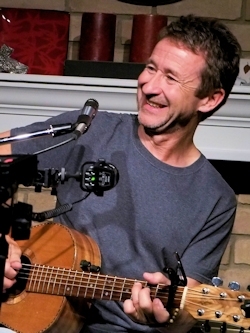 Nashville singer/songwriter/recording artist Christopher Williams added a last-minute HubCityMusic.com house concert to his current tour, and an appreciative audience was treated to a host of new songs. These newest songs are among the best CW has written, and has us waiting with great anticipation for a new CD! Although no firm plans have been made for that new CD yet, it is surely highly anticipated. In the meantime, we will post videos from this concert at the end of this entry. It may take a week or two to get them produced, so check back every few days. Christopher first performed in Lubbock more than 15 years ago, at Durham’s Coffee House, and since that time has gone on to become a prolific songwriter and performer, releasing a total of 11 CDs, to great fan and critical acclaim. An in-demand performer, Christopher has toured all over the U.S., opening for, and playing with noted performers such as Jars of Clay, Arlo Guthrie, Phil Keaggy, David Wilcox, Bebo Norman, and many other well-know performers. It is an honor to have someone of CW’s stature perform in the warm, intimate environment of our HubCityMusic.com living room. Although he remains as down-to-earth and accessible as ever, Christopher is no stranger to celebrity and success. 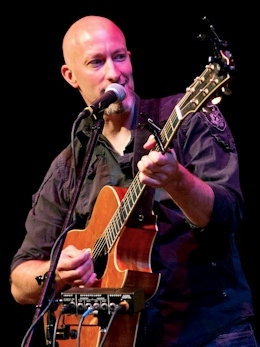 Christopher earned accolades as the Southeast Regional Round winner for the 2011 Mountain Stage NewSong contest, and in 2010 his song “Anything But Fail” won the Independent Music Award for Best New Contemporary Christian Song, at the same time as his live CD “Something As Simple” was nominated for Best Live Recording in the Independent Music Awards. But it is his direct connection with his audience that makes Christopher such a compelling performer. By the end of the evening, each person in the audience felt a personal connection to CW. Here is the song that followed “Know of Love” in this concert, a song he wrote for his son called “Stone Water Wood Light”. Watch full-screen in HD if possible, and be sure to turn the volume up. Listen carefully for his quiet remarks after the applause. This song is the most relaxing, reassuring song I can imagine. Christopher’s newest, and for now his favorite, “Everything You Need”. Relax and enjoy! Here is a video of Christopher’s original “Good Thing” from a previous HubCityMusic.com house concert. One of the best things about hosting these house concerts is all the friendships that have been born and strengthened through this experience. This includes each of you who have attended these concerts and become either new friends or closer friends, and it also includes those musicians who have shared our time and space and food and drink, along with their music and personalities. Our friend Washuntara is one of those special relationships. So when he completed his last concert of this tour and it was time to head back to California, he decided to take a little detour along the way to spend some time with us in Lubbock. This visit was not for the purpose of a concert, but since he was here anyway, he wanted to share our time and space by hosting an impromptu HubCityMusic.com house concert for all his friends and fans in Lubbock. It was short notice, but all our friends who attended can attest that this was perhaps Washuntara’s best HubCityMusic.com house concert yet. Although a bit weary from his recent tour, he ended this chapter on a high note, literally , as his voice soared with an edge honed sharp from all the recent concerts, and his guitar work reflected a precision perfected by practice. Having written literally hundreds of songs, Washuntara was able to pull out fresh material that we have never heard, as well as a few familiar favorites. And we were treated to the first-ever performance of a new song that he just wrote, ” Step Into The Sun”. Click the link below to see this awesome new song! We will post other new videos from this concert soon. Click here to see more videos of Washuntara, and read the review of his previous HubCityMusic.com house concert. Thanks for your overwhelming response to Karleigh Porterfield’s HubCityMusic.com house concert! We had a great audience to hear an outstanding performance by Karleigh, accompanied by fine guitarist Adam Urbanczyk, with the incomparable Cary Banks on keyboards and vocal harmonies. 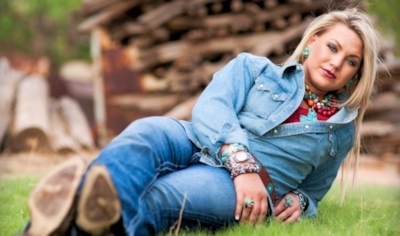 Karleigh Porterfield is currently attending the renowned Music Performance program at South Plains College in Levelland, the program that has been the foundation of many notable careers, including Natalie Maines. You have probably never heard a voice like Karleigh’s in person. Seriously unique, with a range you will not believe. One listen to Karleigh, and you will immediately appreciate the fact that a voice like hers will not be contained, and you will see the potential for a similar music career trajectory as many other talented SPC students have attained. We will post a video of one of her songs here within the next couple weeks, so be sure to check back and see what you missed! Washuntara – An Encore Performance! Washuntara returned for an encore HubCityMusic.com house concert on Saturday February 23rd, and an appreciative audience fell in love with both his music and his message. Having written literally hundreds of songs, there was no lack of material to choose from, and Washuntara played a completely different set for this encore performance. Remaining consistent, though, was his high energy and positive message. 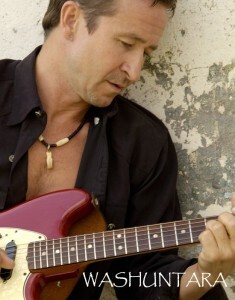 This Australian has shared the stage with the likes of Paul McCartney, the Eagles, the Moody Blues, and many more. Well-known in Australia and Europe, Washuntara is making a name for himself stateside as well, particularly for his song-writing ability. His song “She’s Tough”, performed at this concert, is playing in the background. (or if not, can be heard by clicking at the upper-right of this page). Return to our website in the next few weeks for links to some video from this concert. In the meantime, enjoy some of the links below.